Guests benefit from its prime location just above Zermatt, reached with ease in 30 seconds via a lift from village level. 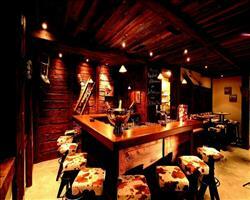 The Schönegg is a popular and beautifully furnished superior chalet-style hotel, with ornate décor throughout. The hotel enjoys super panoramic views across Zermatt towards the Matterhorn and is well known locally for its high standard of cuisine. The restaurant where Pine meets the British agent Angela Burr in the popular BBC1 series The Night Manager was filmed in Hotel Schönegg's atmospheric dining room. All rooms have bath, cable TV, telephone, radio, hairdryer, safe and minibar. 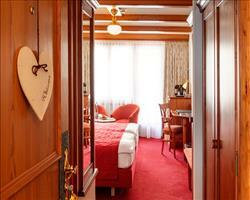 Superior rooms are south-facing with Matterhorn view and balcony or terrace. Rooms are allocated are in a traditional style. Hotel located up a hill but accessed via lift from village level - maximum width of lift 80cms. No specially adapted bathrooms. 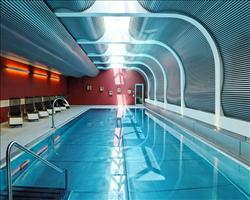 We update Hotel Schönegg's details often, but facilities do change. e.g. some extras listed by the supplier as "free" or included might only be for the first time you use them, or for one time per party, then charged for further use. If any specific feature is essential to your holiday, make sure you ask us to confirm the details of it before you book your holiday. This package holiday to Hotel Schönegg in Zermatt, Switzerland departs Saturday 14th December 2019, for a 7 night stay on a "half board" board basis. A local tourist tax (Taxe de Sejour or Kurtaxe) is levied by many councils in European ski resorts. It varies by standard and type of accommodation and is age dependent, so not everyone is charged. It's not included in the basic price of your holiday and is usually paid locally. For reference, the average charged in winter 15/16 was between 50p and £2 per person, per night. Stay in the world capital of alpinism and ski in sight of the Matterhorn: the greatest mountain destination in Switzerland and quite possibly the world, Zermatt has an unbeatable mix of dizzyingly snow sure slopes, a delightful old mountain town and some of the most jaw-dropping surroundings you'll ever set sight upon. International lift pass (Zermatt-Cervinia) 423CHF (adult 6 day). Ask for a quote when booking Hotel Schönegg. Zermatt has N, S, E, W facing slopes. Usually open for skiing November - April. Hotel Ambassador Zermatt Switzerland, Dover Ferry 14th December. Hotel Perren Zermatt Switzerland, Dover Ferry 14th December. 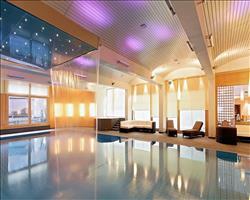 Hotel Butterfly Zermatt Switzerland, Dover Ferry 14th December. 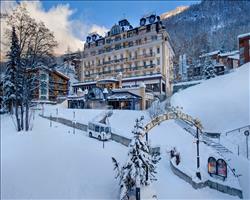 Hotel Mirabeau Zermatt Switzerland, Dover Ferry 14th December. Hotel National Zermatt Switzerland, Dover Ferry 14th December. 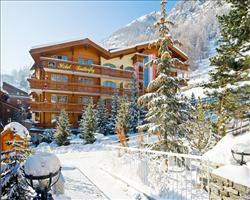 Parkhotel Beau Site Zermatt Switzerland, Dover Ferry 14th December. 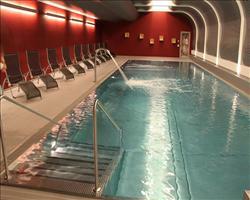 Hotel Alex Zermatt Switzerland, Dover Ferry 14th December. 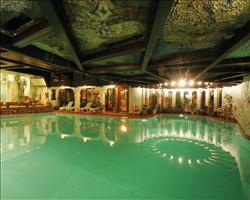 Grand Hotel Zerma... Zermatt Switzerland, Dover Ferry 14th December.